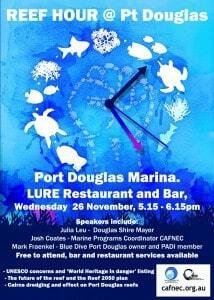 « Call to bring Qld fisheries management into the 21st Century. 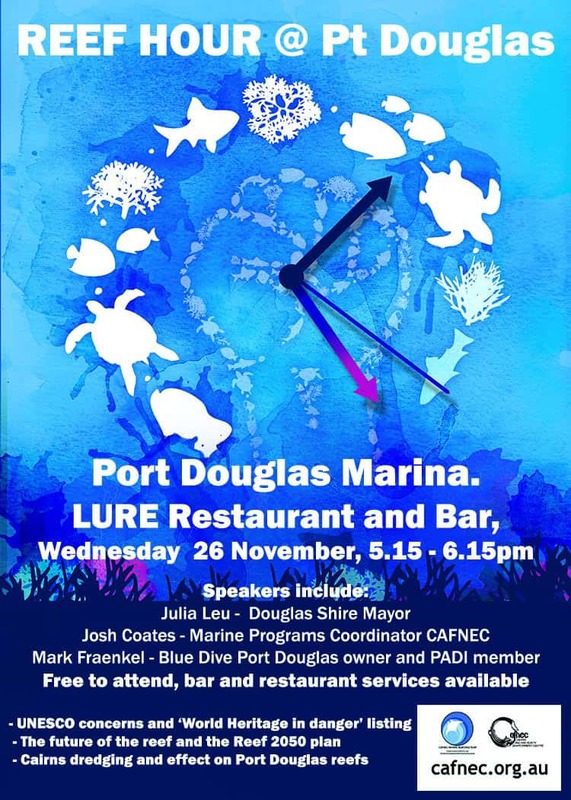 Short presentations from Mayor of Douglas Shire Julia Leu, tourism professionals and environmental experts and a chance for discussions with peers in a relaxed atmosphere. “We are a Reef Guardian council…the Great Barrier Reef is critical to our tourism industry. We are able to boast of having world class dive sites. Reduced investment in the reef at a time when it is most needed indicates the reef has become a low priority and will need to be on a higher priority to avoid rapid decline. 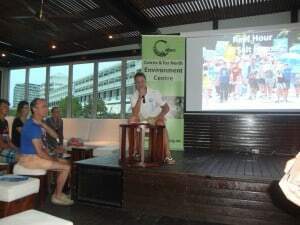 Blue Dive Owner Mark Fraenkel speaking at Cairns Reef Hour event. “The simple demand that emerges is this – if you are dredging, then pay to put the spoils somewhere safe”. “Dumping them off-shore from Cairns is totally unacceptable. These are not benign materials. Wind and currents disperse these materials onto local reefs and many local operators note lower visibility during dredging operations”. This can smother a coral reef from the light that they depend on. “The Great Barrier Reef is still great, especially here in the North but it really is under pressure. To the South we have seen massive loss of coral cover and biodiversity and we cannot afford to repeat mistakes made in the past”. “A combination of sediment, nutrient and pesticide impacts from agricultural runoff, erosion and coastal and port development means that our reef water quality is at an all time low. We need to be supporting our farmers and building reef resilience to impacts we can’t directly control like extreme weather events and ocean acidification. The absolute last thing we should do is allow our Government to spend taxpayers money adding more sediment and nutrient to an already stressed system from new dredging in Cairns”. “It is time to listen to our scientists and common sense and call a halt to new dredging and dumping”.